The following illustrate some of the process involved in planning out fabric akin to the one in the previous post. Black borders outline blocks of 6 stitches/rows, reflect markings on blank Brother card. 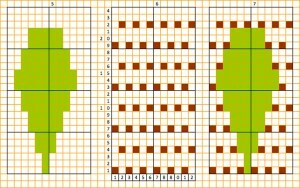 In option A: motif is planned and drawn. In this instance it is colored in in green (1), the area it covers will ultimately remain unpunched on card or blank on mylar. 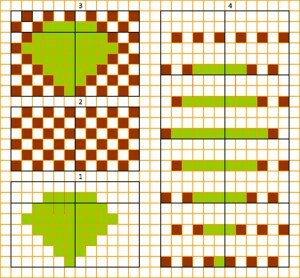 Graph paper may be used to work this out, knit design software, or as in this case, an excel spreadsheet. A grid is created with every other square blacked out or colored in (2). 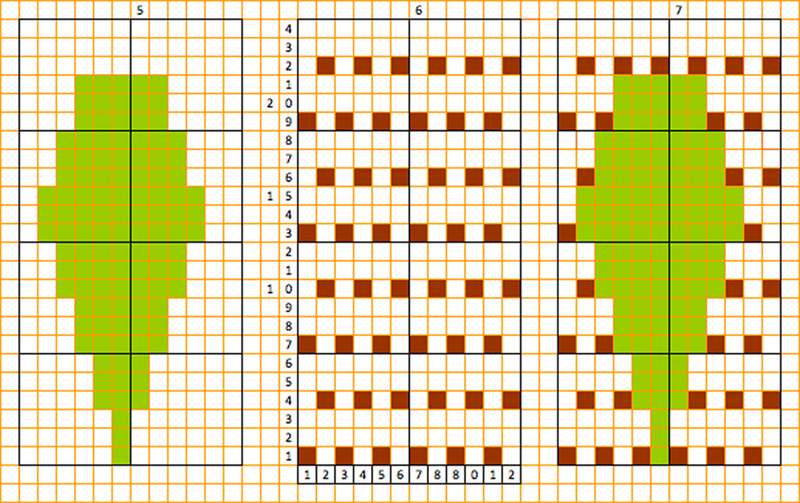 Motif is super- imposed on grid (3). Repeat is expanded adding 2 blank rows above each design row (4). Rust squares represent punched holes in card or black squares in mylar. 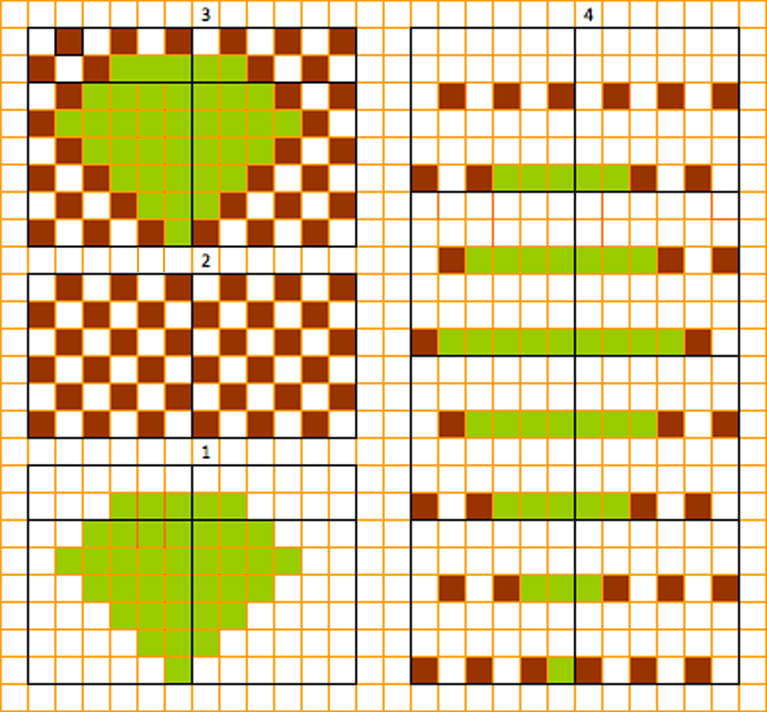 Option B: the same motif is lengthened X3 (5). Lace mesh base is drawn out (6). Elongated motif is then superimposed on mesh (7). Electronic patterning on 910 allows for minimal drawing using all black squares, in turn making it necessary to color reverse for lace. Two separate motifs are used, method for programming such repeats is in 910 manual. However, there are considerations for needle position and pattern selector placement for this “shortcut” to work properly, the steps are described by Kathleen Kinder and others. I prefer to work with what I “see” in terms of punched holes or squares, this is the method used to develop my previous flower motif swatch. The short supply of mylars may also be a consideration in using them or not for such large, and perhaps limited use design repeats. If interface cables and software are available, other options abound.